2009 is shaping up to be an expensive year for reverb-lovers, as this is another space-maker that you simply must try. …But fonts could be clearer. 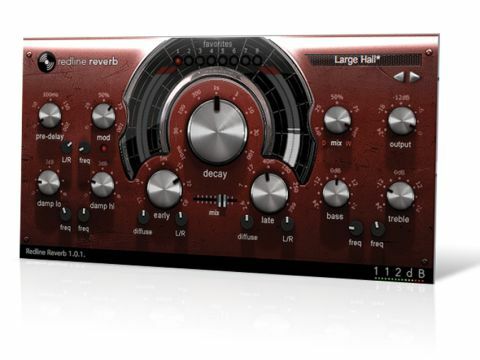 While many reverbs opt for convolution-charged ultra-realism or offer separate plate, hall and room algorithms, 112dB claims that its Redline Reverb takes a slightly different approach, with a single core algorithm that you can shape in a variety of ways. But is it really different enough from the competition to make it worthwhile? Reverbs aren't exactly uncommon, so we'll focus here on what makes Redline Reverb interesting, with an emphasis on creating a virtual space. Based as it is on sliders and knobs, the interface isn't going to win any innovative design awards. However, everything can be found quickly enough and, once there, you can choose from different types of knob/mouse response. "112dB claims that its reverb takes a slightly different approach, with a single core algorithm that you can shape in a variety of ways." All the usual controls are here: high-/low-frequency damping, pre-delay, tail modulation, reverb decay times, space size, diffuse settings, bass/treble EQ and mix controls. We love the logical way that it's all been laid out, though with the standard and vintage fascia colour schemes, it can sometimes be hard to make out some of the settings due to the font. The manual says more skins may become available, so let's hope they arrive soon. On the plus side, however, the floating tool-tip windows make it very clear what you're hovering over. The stereo balance controls for both the early reflections and the reverb tail are things not normally seen on a plug-in of this sort. Plus, if you decide that you don't like the new setting while turning a knob, you can easily snap back to the original value by moving it close by. The main selling point of any reverb should be its sound, and one of the things that impresses us most about Redline Reverb is its musicality. It really enhances the material, rather than fighting for space with it. It's perhaps not the most realistic unit we've ever heard, but complaining about that would be missing the point entirely. Like the top-end digital units of yesteryear, it just sounds gorgeous. To demonstrate its abilities, place it on a vocal channel with its default settings, and you'll immediately get an effect reminiscent of an enhancer - only cleaner and sweeter than most! A quick glance at Redline Reverb's presets shows what the creators were aiming for, with all but one of the categories named after classic Lexicon reverb units. The resulting sounds aren't far off the mark either, and while we'd hesitate to say that 112dB has entirely captured the magic of said hardware, there's certainly a similar style of reverb and warmth on offer here, and at a price and level of convenience that's hard to ignore. But how did they achieve this sound? Well, it's all based on the algorithms of a couple of Reaktor ensembles called Rev-6 and Space Master, both created by Martin Zwartjes. These have been reworked and coded by hand, thus greatly reducing the CPU load, and it seems to have worked out nicely. On our 2GHz MacBook, for instance, we could run a dozen instances of Redline Reverb (using the default preset) before the sound started to crackle and break up. We would argue that Redline Reverb is not so fundamentally different as its manual and press preamble would have you believe, but the results are far more important, and it's the sound that truly sets it apart. It really is indescribably warm and lush, with a sound-enhancing character, and by offering just one core algorithm with plenty of editing options, it's actually extremely versatile. So, if you want something a little special that can spice up and enhance anything from leads and pads to vocals and effects, or that can be used as an upfront creative effect, make sure you get your hands on this one.